Kansas Governor Sam Brownback announced today he will help kick-off the pheasant hunting season next fall with the first annual “Kansas Governor’s Ringneck Classic” near Oakley, Kansas. The Classic will take place November 18th – 20th. The Governor said he is establishing The Classic to better market Kansas as the premiere destination for pheasant hunting in the Midwest and to showcase the Kansas wildlife industry to those inside and outside the state. "My top priority is to grow the state’s economy. Key to that is capitalizing on the competitive advantages our state has," Governor Brownback said. 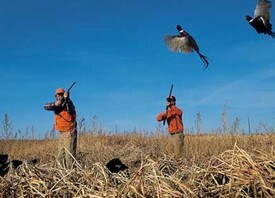 "Kansas is consistently ranked as one of the top three states in the country for pheasant hunting. This is an underutilized asset for our rural communities. If we do a better job telling folks about the quality hunting available here in Kansas, we will pull more of those tourism dollars into Kansas." The economic impact of hunting in Kansas is already substantial – bringing in $271 million annually and accounting for nearly 6,000 jobs. But when compared to a state like South Dakota which attracts more than $220 million in pheasant hunting alone, the potential growth in this agritourism industry in Kansas is tremendous. The inaugural hunt will invite community and business leaders from across the country for a weekend of hunting as well as networking with local business leaders on the expansion of the industry. “Pheasant hunting in Northwest Kansas has a long and cherished tradition. The Oakley community is thrilled at the opportunity to represent Kansas and Governor Brownback as hosts for the inaugural hunt,” Hunt Organizer Raelene Keller said. The weekend will include registration and a community dinner on Friday night; then hunting and an awards dinner on Saturday and followed by a bonus hunt on Sunday.